Spring and fall are known for their warm days, cool nights, and in the world of lawn care, this is the time for weeds. Many of the weeds that present themselves during the cool seasons are considered broadleaf weeds. A well established lawn may still have some weeds throughout the season, but nowhere near as bad as a lawn left untreated with compacted soil, or thin and bare spots throughout it. Below are some of the most common cool season lawn weeds. A patch of clover within your lawn can be unsightly, with its green leaves and eventually white, or even sometimes red, purple or yellow flowers; this pesky spring weed is one of the best known. With their trifoliate, or 3 leaves, these patches stand out like a sore thumb and seem to spread little by little throughout the lawn, which is good for bumble bees but not so good for homeowners, unless you find a 4 leaf clover! Henbit is a winter annual that blooms in the spring and is considered a member of the mint family. The flowers are purple, tubular shaped and form in whorls in the upper leaves. Henbit thrives in cool weather, newly seeded areas and thin or dormant lawns. 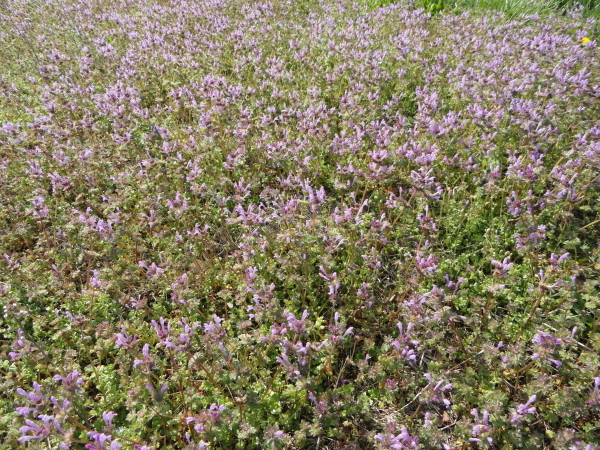 Large patches of Henbit can also be found in crop fields. While the spiky leaves of the dandelion plant may go unnoticed, having a bright yellow dandelion pop through the green grass, and eventually turn into the puff ball of new seeds, is probably the most unsightly spring weed. This plant actually germinates in the fall, so all the dandelions need is a couple warm spring days before they begin to pop and add a little extra color to the lawn. Chickweed is a bright lime green colored weed with small leaves and thin stems that will often have a white flower. This is considered a ground cover plant due to it laying flat on the ground and growing outwards. Common Chickweed flowers and seeds at the same time; it is important to stop it before seeing any flowers. This plant germinates in the fall and will start to pop once spring hits. Broadleaf plantain is a very thick spring weed with large, spiny, oval leaves and even stalks that shoot out of the center several inches into the air. These stalks contain the seeds which are pollinated by the wind. This plant likes to grow in areas that have been disturbed by humans such as along roadsides or in lawns with bare areas. To the untrained eye, black medic can resemble clover or chickweed. Black medic is a ground cover plant whose stems can grow to be up to 2 feet long. If it reaches the flowering state, black medic will produce small yellow flowers, sometimes up to 50 flowers per plant. Unfortunately, each plant can produce a few thousand seeds, which can live in the soil for years. This plant does best in dry and compacted soils that contain little nitrogen. To sum it up, weeds need room to grow. Having a thick and healthy lawn will nudge these weeds out of your lawn. Annual fall aeration and seeding is recommended. Be sure you are on the proper fertilization and weed control regime as recommended for your area. Just as quickly as the seasons changed to sprout these pesky weeds, they will change again to take them away.